Do you want to throw back to the 80’s and organise an eighties theme party? You’ll probably want to include as many 80’s nostalgic ideas and items as you can. There are tons of fun ideas to help you make your eighties theme party memorable. The eighties were defined by its music. If you’re planning an 80’s party you will need to compile an 80’s playlist. But this is hardly impossible and will take much of your time. To be sure the playlist includes all the hits from the eighties it’s the best option to hire an eighties DJ who has a playlist with hundreds of famous eighties songs. You’ll need to set the mood for your eighties party with the best decorations. Cover the walls with movie posters from the eighties and posters of 80’s popstars, get a strobe light and rent a projector to play old 80’s videoclips or movies on a wall. 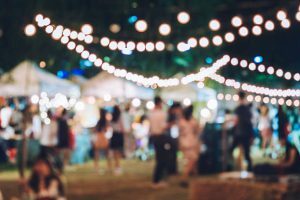 Do you need a professional advice for organising a theme party? Then don’t hesitate to contact us. Evenses is the entertainment professional and specialized in party entertainment. We can give you an advice or organise a professional 80’s theme party for you.